Try Pexels Videos to Find Green Screen Backgrounds – TC Net-Works, Inc.
Making green screen videos can be a fun way for students to share what they’ve learned through research about a place or event. And it’s a great way for kids to make their own weather forecast and newscast videos. Last week on Twitter I was asked where I go to find video clips to use as the background for green screen videos. 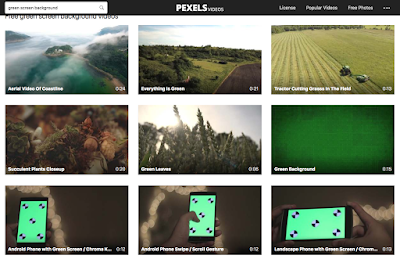 Pexels Videos is a good place to find free video clips to use as background in green screen productions. Pexels Videos offers hundreds of short videos that you can download for free and re-use in your own video productions. You can browse the collection or search according to keyword. You can also just jump to this selected collection of video clips suitable for green screen productions. The videos are stock footage and very few have any spoken words in them. To download a video from Pexels you just have to click the green download button next to the video you want to use. You don’t have register on the site in order to download Pexels Videos. Attribution is not required for most videos, but double-check before using a video that you’ve downloaded from Pexels Videos. When you are selecting a video to use as the background in a green screen production, try to choose one that has some fairly wide open space so that you’re not blocking key background elements when it is used behind a person. Learn more about making green screen videos in my upcoming course, Video Projects for Every Classroom.